That's the question animating much of the discussion of Saturday's white supremacist rally in Charlottesville, Virginia, which quickly devolved into a brawl between rally-goers and a contingent of anti-fascist counterprotesters known as antifa. Following the clashes, a white supremacist rammed his car into the counterprotest, killing Heather Heyer, 32. Leaders and activists across the spectrum — except President Donald Trump — have unequivocally condemned the racist, anti-Semitic rally. But they are divided on whether physically attacking white supremacists is justified simply because they are white supremacists. Some have celebrated the antifa activists for standing up to hate. But others have condemned them alongside neo-Nazis for engaging in violence. And on Tuesday, Trump appeared to equate them with the rabble of white supremacists, branding antifa the "alt-left" and saying "there's blame on both sides." Here's what you need to know about antifa, the loose network that fights fascists on the streets. 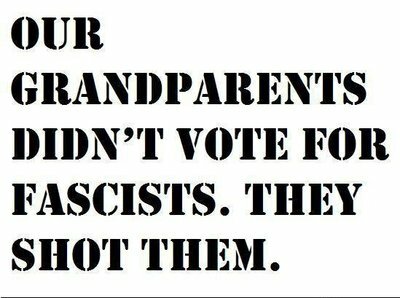 Antifa was born from groups that fought the original fascists. In 1934, Milwaukee police arrested three leftists who infiltrated a pro-Nazi meeting and began scuffling with supporters of Hitler. The leftists were part of a group of several hundred anti-fascists who entered the meeting, broke it up and pelted the keynote speaker with rotten eggs. The melee ended only after 100 police arrived to restore order. Today's antifa (an abbreviation of "anti-fascist action") sees itself as the ideological descendant of activists like these. 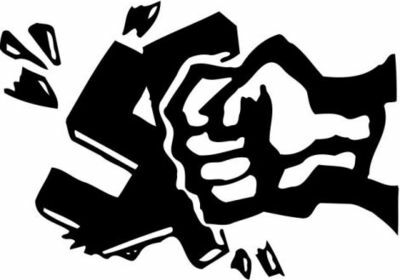 Anti-fascist brawlers — many of them communists, socialists or anarchists — began organizing in the 1920s and '30s to oppose the rising dictatorships in Italy, Germany and Spain through demonstrations and street fights. 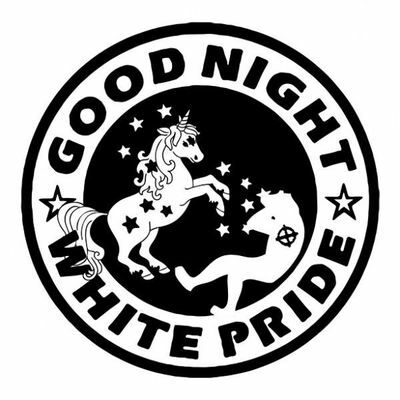 The groups re-emerged in Europe in the '70s and '80s to combat white supremacists and skinheads, and the idea migrated to America, where groups were originally known as "Anti-Racist Action." While it's hard to pin down numbers on antifa in the United States, members and experts say the movement has boomed since Trump's election. 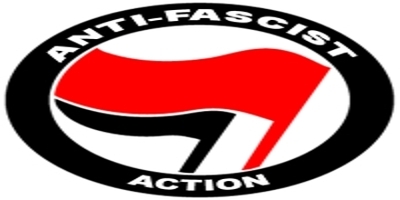 Mark Bray, a lecturer on human rights and politics at Dartmouth College, estimates that there are a couple hundred antifa chapters of varying sizes and levels of activity across the country. "The threat posed by the 'alt-right' in the context of empowerment through Trump made a lot of people concerned about fascist, neo-Nazi, white supremacist violence," said Bray, author of the forthcoming book "Antifa: The Anti-Fascist Handbook." "They turned to the Antifa model as one option to resist it. The option of physically confronting these groups has spread among the left and been normalized." It has no formal organization or leadership structure. Like the Occupy movement and Black Lives Matter, antifa has no institutional structure or unified plan of action. Much of its activism comes through informal collaboration around certain cities or regions, and individual members taking initiative. 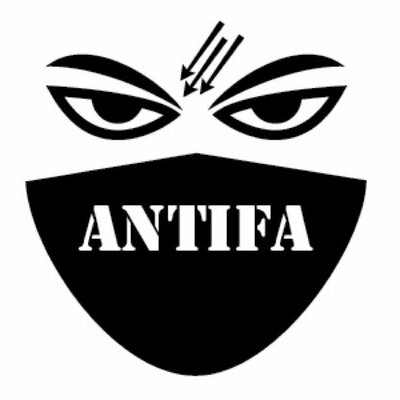 Separate Facebook pages exist, for example, for New York antifa, New York City antifa and Western New York antifa. Long before antifa gets to physical altercations with the far right, members will attempt to prevent white supremacists from assembling or spreading their message. Bray said some antifa members will pressure white supremacists' employers to fire them. "I've always identified with the spirit of the movement, which is to challenge racists when they come into your community and try to incite hatred and violence," Sieradski said. "Every effort is made to prevent the Nazis from showing up in the first place. Once they manage to do so, the demonstrations do not get violent until confrontations are provoked." Antifa tends to align with the left — and some members are anti-Zionists. Because antifa is so loosely constructed, it has no formal ideological agenda beyond opposing fascism. But the movement has roots in left-wing movements like socialism or anarchism. Bray said that members may be part of other left-wing activist groups, like the Occupy movement, and subscribe to ideas popular in progressive circles. 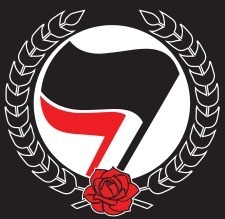 The Torch Network, a group of antifa chapters, includes in its "points of unity" opposition to "all forms of oppression and exploitation." That includes fighting "against racism, sexism, nativism, anti-Semitism, Islamophobia, homophobia, transphobia, and discrimination against the disabled, the oldest, the youngest, and the most oppressed people." The group is also pro-choice. Unlike the Movement for Black Lives platform, it does not single out Israel or Zionism. 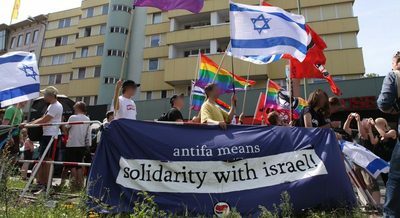 Bray said that while anti-Zionism is not a focus of antifa, many members tend to be anti-Zionist as part of their far-left activism. Anti-Racist Action groups, he said, had taken part in anti-Zionist events in the past. Sieradski said, however, that Jews play a significant role in the movement because "we're fighting Nazis and anti-Semitism is the prime ideological viewpoint of Nazis." Antifa has no qualms about scuffling with white supremacists. The group gained publicity in February when it physically fought alt-righters at the University of California, Berkeley, during a speech by alt-right provocateur Milo Yiannopoulos. Tussles with the far right have followed at other events. Sieradski said violence is a "last resort," but added there is nothing wrong with responding to anti-Semitic or racist rhetoric with a punch. Those who are advocating ethnic cleansing should be punched, he said, and showing white supremacists that their rallies will end with them being hurt will deter them from assembling. "When Nazis are screaming epithets in our faces, should we just smile?" Sieradski asked. "They come into our towns and yell at us and threaten us and say they want to kill us. Should we take that sitting down because fascists deserve free speech, too? When someone is threatening you with an existential threat, you fight back. You don't stand there and take it." Antifa members also reject the notion that the movement instigated the violence in Charlottesville or is as guilty as its white supremacist foes. Spencer Sunshine, who counterprotested at the Charlottesville rally and witnessed the deadly car ramming, said there certainly were fights, but there is no comparing antifa with the far right. "Any equivalence between antifa and fascists is a complete lie," he said. "We were not armed the way the fascists were, and certainly did not drive a car into crowds. It was a total Nazi rally." ... but has been criticized for its violent tactics. Antifa has garnered its share of liberal critics who say nothing — even neo-Nazism — justifies violence and the suppression of free speech. Critics also say that antifa's violence draws attention to the far right and allows white supremacists to claim they are acting in self-defense. "They're troubling tactically because conservatives use antifa's violence to justify — or at least distract from — the violence of white supremacists, as Trump did in his press conference," the liberal Jewish essayist Peter Beinart wrote Wednesday in The Atlantic. "They're troubling strategically because they allow white supremacists to depict themselves as victims being denied the right to freely assemble. And they're troubling morally because antifa activists really do infringe upon that right." 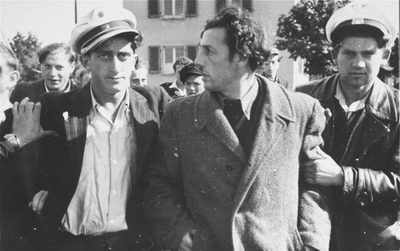 A lesson for "liberals:" Jewish police arrest a concentration camp kapo, or traitor Jewish functionary, at a displaced persons camp in Germany after the second world war. Following Saturday's rally, Anti-Defamation League National Director Jonathan Greenblatt tweeted "Whether by #AltRight or #Antifa, no excuses for violence and, keep in mind, this is exactly the response that the bigots seek to provoke." Mark Pitcavage, an ADL senior researcher, said his group cannot condemn one side's violence and condone the other. He added that the attention Charlottesville gained is also energizing the "alt-right" to hold more rallies. "I don't know how you can put together a calculus of violence where some sort of act of violence is unacceptable if one group does it but if another group commits it, that's acceptable," he said. "We'd just rather not see violence." 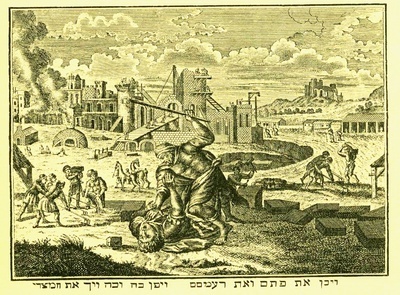 Moses kills the Egyptian overseer, from the classic Passover Haggadah as printed in Amsterdam, Constantinople, etc. 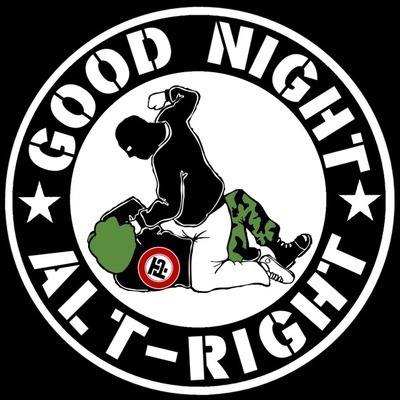 Would the ADL issue a statement condemning this act of violence? But Pitcavage added that right-wing violence has been far more destructive than antifa's, which to his knowledge has not led to any deaths. 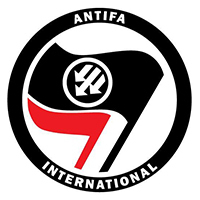 According to a 25-year study by the Cato Institute, nationalist and right-wing terrorists have killed about 10 times as many people since 1992 as left-wing terrorists, which may or may not include those who identify with antifa. "That doesn't mean that the sides are equal, the causes are equal," he said. 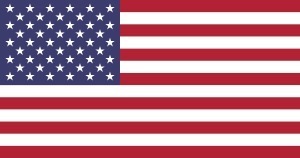 "It's important to realize that their violence does in no way compare in numbers or severity to the far-rightist violence in the United States."